My pick for Best Shot captures that "80s-ness" that I love in the film. 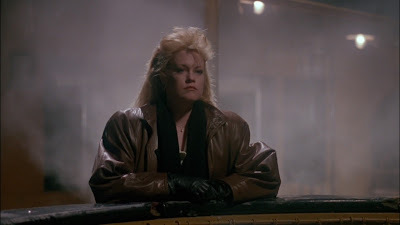 The hair, the accentuated shoulders, the smoke, Melanie Griffith's dramatic face. It's a pivotal scene which precedes Tess' transformation and you can certainly sense that change coming. But what's interesting is that Griffith's performance is far more subtle than this scene would suggest. Her rising confidence and comfort in her own skin is much more gradual and realistic than you'd expect from the direction. She never loses sight of her naturally demure self, which makes her payoff at the end all the more satisfying.